Post delivery care of the mother is very crucial. This Indian Diet Plan For Mothers After Cesarean Delivery will help you understand the diet pattern to be followed after a C section . 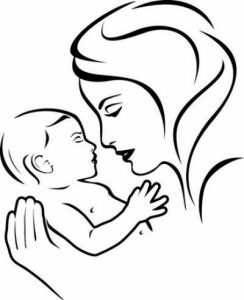 What to eat , What to avoid and how to care for the mother. Your search ends here. When planning their delivery, most women aim to have a normal delivery but many a times, due to certain complications and/or conditions, a c-section becomes inevitable. Low lying placenta, breech position, chord around the neck, high blood pressure and growth issues in the baby are some of the reasons that lead to a c section. A cesarean section makes a woman really weak and vulnerable. It is a real challenge to get up and walk with the stitches on your lower abdomen. Post delivery, the uterine lining and blood is eliminated from the body and this process make take anywhere between 10 – 40 days. The birth of a baby changes a woman’s life entirely. She enters a new phase of life and has to enact a new role, that of a Mother. She goes through a lot of emotional changes and physical changes after a c-section. Hence proper rest , proper food and proper care is a must. Here is an Indian Diet Plan For Mothers After Cesarean Delivery that you can refer and plan your post natal care accordingly. After any surgery, a person is supposed to take a lot of rest but after a c-section, a mother has to take care of her little one as well. A lot of precautions need to be taken post delivery. Post c-section, a woman needs to take great care while sitting and getting up from the bed or chair. She should move around slowly. She must not climb stairs. The incision on her abdomen needs to be protected at all times since the wound takes time to heal. All women are advised to take rest for 40 days. Although the woman should not pick up any weights, she needs to hold her baby as often as required. Body Massages for 1 month after delivery is a common practice in India. Although a lot of women are confused when it comes to massages after c sections. In General massages post delivery help a great deal in recovering , healing the body , relieving pain in the lower body, and helps in revitalizing the entire body. Most doctors ask to delay body massages for initial 2 weeks after cesarean delivery, But you can start after 3 days . Just make sure you hire an experienced and delivery special masseuses. avoid the abdomen area massage . Let your surgery scar heal . Start with legs , feet , arms , hands and head. Back massage can put pressure on the scar area if you lie down on your tummy. hence it should be avoided. If you are in too much pain , light strokes of massage while you are sitting , or lying on your sides will do. once your scar heals and the doctor gives a green signal , you can go for light strokes of massage around your abdomen and scar area too. But make sure you take your doctors permission before doing so . Before we see the Indian Diet Plan For Mothers After Cesarean Delivery, We first need to understand the nutrient requirement of women after c section. In the first few days after delivery, a very light diet should be taken. However, the mother would need to resume her regular diet with lots of nutritious foods since she needs to replenish the nutrients that she has lost during pregnancy and she also needs to feed her little one. In fact, it is said that if the mother feeds her baby immediately after having a meal, the baby gets a wholesome meal too! A mother should eat every few hours during lactation. Small frequent meals are advised since her stomach might not be able to digest huge quantities easily. The digestive system and bowel movements take some time to start functioning to their full capacity. Eat foods that are easily digested. Usually bowel movements get back to normal 3 days after delivery but if that doesn’t happen, one should consult a doctor. It is advisable to eat something every two hours as that’s the duration after which you need to feed the baby! Here is the detailed video on Indian Diet Plan For Mothers After Cesarean Delivery. 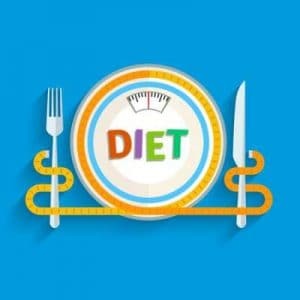 After watching this video , you can also take a screenshot of the diet plan given below and print it for further use . Eating a protein rich diet is a great way of healing the tissues and it is very important for the healthy growth of your baby. Proteins also help in maintaining the muscles after the surgery. Eggs supply zinc and proteins to your body. Fish is also rich in omega-3 fatty acids which are very beneficial for your health. Vitamins should be taken in sufficient quantity since they contain lot of antioxidants which help in repairing tissues. It also helps in producing collagen in the body which helps to build new scar tissues, tendons and skin. 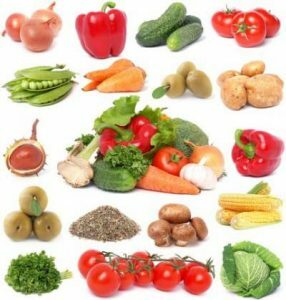 Sources of Vitamins- Eat fruits and vegetables that are rich in Vitamin C, such as melons, oranges, papayas, strawberries, grapefruits, tomatoes, sweet potatoes and broccoli. The mother loses a lot of blood during and after childbirth and thus the iron reserve in the body needs to be replenished. Lack of iron can make you weak and lethargic. Eat foods that are rich in iron. Take care not to eat excess quantities of iron since it can lead to constipation. Sources of Iron – include walnuts, red meat, oysters, dry fruits, figs, beef liver and dried beans. Calcium helps in relaxing the muscles, promoting bone and teeth health, in blood coagulation and in preventing osteoporosis. Milk should be had sparingly since it is a very good source of calcium and facilitates the production of milk for the baby. Yogurt is another way to supply calcium to your body. Yogurt also contains zinc and the most advantageous thing about it is that it can be consumed with a variety of dishes. Sources of Calcium – The mother should include milk, cheese, yoghurt, spinach, kale and tofu to supplement the intake of calcium. Fiber is required so that you do not suffer from constipation. Constipation can put undue pressure on the wounds. Fibrous fruits are not only very nutritious, but they also help to avoid constipation. Sources of Fiber – Eat lots of raw vegetables and fruits as salad in order to add roughage to your diet. Breastfeeding can make you exhausted and thirsty. The mother should take plenty of fluids in order to ease bowel movements and to produce sufficient quantity of milk for the little one. You can drink low-fat milk since it is easier to digest. Take special care to avoid caffeine. caffeinated drinks include cold drinks, coffee, energy drinks , tea, carbonated drinks. Sources of Fluids – non-citrus fruit juices, soups, coconut water, herbal teas and buttermilk . Green teas are allowed too if you consume the decaffeinated ones. 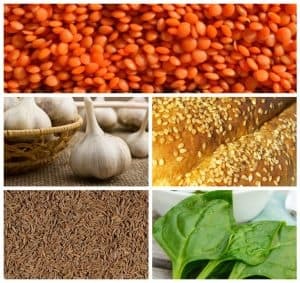 Garlic (lehsun), Fenugreek leaves and seeds (Methi), fennel seeds (Saunf), Cumin seeds (Jeera), Sesame seeds ( Til), Almonds (Badaam), Bottlegourd (Lauki), Ridge Gourd (Torui), Spinach (Palak), Orange Lentils (Masoor dal), Oats and Daliya. The activity level is low after delivery since you are advised to rest. Avoid all fatty foods and junk foods. These will only add on to the weight. Avoid eating spicy foods since they can cause gastric trouble. Your baby might also get the flavor in his milk. Citrus juices and carbonated drinks should be kept at bay since they can cause flatulence and gas. Caffeinated drinks such as tea and coffee should be taken in moderation only since these are diuretics. These drinks are high in caffeine and can cause problems in your baby’s growth. It is better to stay away from alcohol as it can impair the mother’s ability to breast feed and can cause developmental problems in the baby. Avoid gas forming foods like Urad dals , chola , rajma, chawali, channa, Besan, Pickles, Green peas , Dry peas. Vegetables like Cauliflower , cabbage , Bhindi, broccholi, Onions are better avoided for the first 40 days. Later on , they can be introduced in the mother’s diet slowly. Avoid any sort of fried food. They are very difficult to digest in the first 40 days and can lead to gas and stomach ache and burns. Avoid ghee and rice for the first 3-4 day after C- section. After 4 days you can start eating rice once a day. Unlike the myth that says you should not eat rice as the scar will not heal. This is true in case if the mother is diabetic , as high blood sugar levels will interfere in healing of scar , but for a non – diabetic average Indian women this does not hold true. Very cold food and drinks. This restriction is imposed on mother just for precaution. If the mother catches cold, treatment becomes hard if she is breastfeeding. The medications are excreted in breast milk and the baby’s health gets affected too. Now that you know about what foods are allowed and which foods should be avoided, let us see the detailed Indian Diet Plan For Mothers After Cesarean Delivery. Here is a detailed Indian diet plan for mothers after cesarean delivery. This plan also contains foods that will help in increased milk production and hence improve lactation. you can start following this plan after 5 days of delivery. Ragi vermicilly upma with carrot and cashew 150 4 Provides essential nutrients to baby through breast milk. calcium helps in healing and replenishing mother stores. cashew helps in lactation. Curd 1 small Bowl 75 4 curd Provides calcium, protein, Vit A and D very beneficial during recovery from delivery . just make sure it is fresh and at room temperature. Egg Omlette(2 No.) 160 10 Eggs are easy to make and best sources of proteins that helps in baby’s growth when you feed. Vegetable oats upama (1 soup bowl) 250 3 Multi nutrients from veggies and good fiber to tackle constipation and het your bowel functions back to normal. Apple Or Pomegranate (1 medium size) 40 – These fruits help in maintaining hydration and Ph balance. Coconut water / Ajwain water 30 – It Benefits in constipation, sluggish digestion, heart burn and urinary tract infections. Palak Paneer(1 small bowl) 150 6 Spinach is rich in folic acid and iron and helps in maintaining healthy lactation and increases milk secretions. Stir fried parval- 2 no. 60 Raw salads can be hard on digestion , stirred parval is helpful in changing taste and providing fiber to the new mother. 1 Mix Ladoo (coconut,almond and poppy seed ) 150 4 Helps in lactation. provides calcium and other essential nutrients required for brain development of baby. Poppy seeds helps in keeping headaches at bay. specially if you have migraine problem. Beetroot + carrot kheer(1 bowl) 150 6 Beet root and carrots increase heamoglobin and are rich in Vitamin A. It helps in growth of the baby. The Above mentioned Indian Diet Plan For Mothers After Cesarean Delivery is a general diet plan for an average sedentary Indian women. The mentioned food items have proven to be beneficial in most of the cases. if you are allergic to a particular food mentioned above , kindly consult your doctor before consuming foods mentioned here. Hing / Asafoetida – Adding Hing to food after post pregnancy is especially important. This helps in better digestion and eases out the gas / flatulence issue that every mother faces after delivery. Ajwain / Carrom seeds – These seeds helps in digestion . It is tender towards the digestive system, especially if the mother is breast feeding. it is believed that Ajwain’s aromatic oil are released in breast milk , and helps in regulating baby’s motions and digestion. Jeera – Along with the above mentioned spices , Jeera too has a significance in a post operative mum’s diet. Jeera helps in digestion as well as helps in milk production. Some indian families also make special jeera ladoos for new moms . these spices should be added to a post operative mum’s diet whenever possible. Many women wish to get back in shape soon after the delivery but that is practically inadvisable. Just as it takes time to gain weight during pregnancy; it does need time to lose the accumulated fat. Also, you now have the responsibility of feeding a growing baby and you cannot stop eating yourself. Not only can it harm your body after the surgery; the baby can also become malnourished. Do not fall in to the trap of people who offer crash diets to get you back in shape. Strenuous exercises are avoided in the first few months since the wounds are still healing. Understand that your body is weak and needs all the nutrition and rest before exerting much. As a matter of fact, women who nurse their babies lose weight faster than those who bottle-feed their baby. So you can refer to our Indian Diet Plan For Mothers After Cesarean Delivery and have a blissful motherhood. my baby is 3months old,I had c-section,I’m having lot of body pains and back pain,I’m using calcium and multivitamins tablets daily,but don’t know why my body pains r not going. Could u please suggest me best way to get rid of these pains and is it common to have body pains after c-section and how long will body pains will be there. 3 months , the pain are all gone by now in normal case .. what does your gyneac ay about this ? did you get proper body massages done during your confinement period ? My baby is 10 month old. Im having back pain after c section. But back pain not going. But I do. I’m having multivitamin as well. Back ache is a common problem in wome after delivery . are you taking Vit D and calcium , this helps a long way . how about your weight ? how much weight have you gained , if it is nominal , then fine . but other wise weight loss will hlp you in getting rid from this . I think if the pain is severe , it is best to see an ortho for it . you may require some physio therapy / exercises for correction of posture if that is an issue. I am Jyoshna, i have 3 months baby. I had c section. Can i eat banana and mangos. Pls suggest me which food good. yes you can have both . just dont over eat them . stop at 1 . I had my 2nd c section 2 months ago. I am a south Indian woman aged 32 yrs, working in a bank. I am 5.3 inches tall and now weigh up to 67kgs. I want to get rid of the weight gained during pregnancy and also become fit. So started following your diet plan. But was wondering if I will lose weight or gain weight with it. Seems like lot of eating the whole day. Moreover want to loose the belly fat after delivery and also the lower body part especially thighs. Please suggest both diet and suitable fitness plan. Thank you for your wonderful and informative webpage . Hi mam..i hav twenty days bby..in always feelin hungry ..I had type 2 diabetes n NW was insulin during pregnancy.bt NW in not on insulin r tablet..pls provide some diet chart. what are your sugar levels now ? Hi I had 2 c-section delivery 2nd baby 3m9nths completed now that diet plan now can I start nd it will loose our weight.. Then doctor told light exercise can do but which one light exercise? Hi can i eat peanuts(ground nuts) after 6 weeks of c section. Peanuts will give you gas . wait for a few more weeks. and have it when you start mobilizing around the house. My wide had C-Section delivery at last tuesday. But still she have a belly abdomen and bleeding is very low. Whenever she is going to change the pad then check about the bleeding in the pad. So she have very low bleeding and till stomach have belly. Why this is happened? What we do? Is this any issue to her health? Hi Laxmi , yes you can start taking chicken now .. but start in less quantity .. and check if it affects your baby’s digestion after you feed … if all remains normal .. you can slowly start taking more chicken .. start with taking chicken soup ..
Hi , I have a 3 month old baby delivered through c section. elders in my family are not allowing me to eat anything other than moong dal , eggs ,methi for lunch and dinner.i am bored with same type of food .please suggest me what all vegetables I can include now in my diet.also suggest good snacking options as I always feel hungry. the above emtnioned chart can be used as it is … the items you mentioned are definitely good , but yes monotonous , use the variety of dishes mentioned above ..
Hi Neha , dont worry , this is the right time to introduce legumes in your diet .. just remember , that go sloww.. dont eat much at once … start by having 1/2 bowl or so .. and watch for symptoms , if you baby digests it wekl , you can then start having regular quantity. Hiii ma’am… I got a normal delivery and now I m completed with 6 days…I eat lots of raw rice after delivery is that effects anything? Raw rice ? you mean uncooked ? I had 1 Baby in caesarean in 16days completed now my hib position in black mark how it’s remove Mam plz help me then this food chat I follow. sorry , i did not understand your question . Hi mam, im usha, my baby is 2 mnths old now. i had c- section jn july. Recently i was attacked with typhoid fever im using tablets now, my doctor told me to feed baby now also. But when im feeding her, her body temperature is slightly rising up. That too my milk is not sufficient for her. So i was giving powdered milk too. What should i do to increase breast milk. & should i feed her when i use my tabs? You can start using t he belf after your 45 days of c section , when you consukt the gyneac, you need a confirmation from her regarding the stiches . I had my c section 40 days back and my baby is completely on formula milk because of no mother’s milk and I have used tablets and powders suggested by my gynecologist. But still no milk so doctor told to continue with formula milk. So, please tell me diet to reduce my pregnancy weight and by belly. I had my c section a month ago. Also it was premature delivery of 28 weeks and the baby is no more now. Please suggest after how many days I can start workout for loosing weight, also suggest diet plan accordingly. Hi Neha , I am sorry for your loss. You can start working out from 3 months from your operation date. you can contact us after 2 months and we will help you with a diet plan as well. can i have eggs and fish after c section? How many days will it take to heal the wound? Hi Mallika , you can have eggs after 5 days of c section . for fish , you should wait for 15 – 20 days , and based on your digestion you can start with fish . Peas and beans cause flatulence hence we would avoid them for the first 40 days.